Dr. Emily Welty, Assistant Professor and Director of Peace and Justice Studies at Pace University New York City, challenges the UN General Assembly First Committee to take the gendered dimensions of disarmament more seriously. Photo: Shant Alexander for Control Arms. As member states deliberate on international security and disarmament issues this month in the UN General Assembly First Committee, it has become increasing clear that Pace University New York City – particularly its Model UN program – is playing an emerging role in global policy discussions. 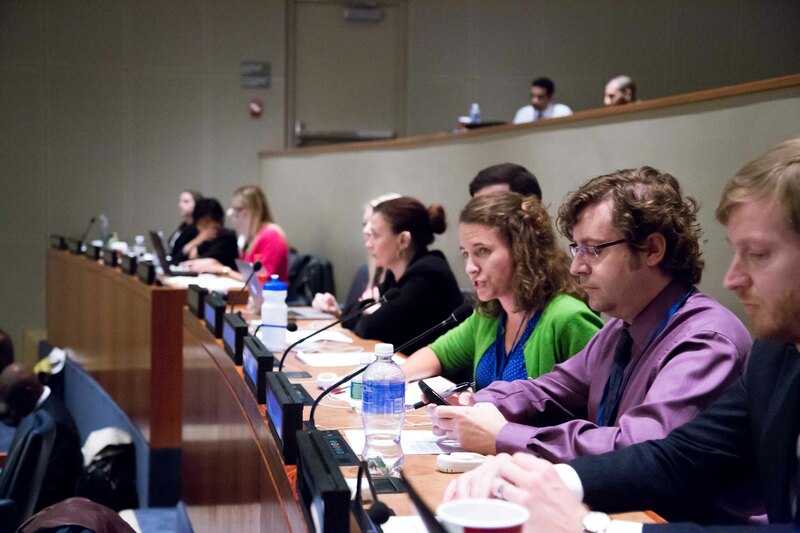 On Tuesday, 28 October, two Pace University professors – Dr. Emily Welty and Dr. Matthew Bolton – gave testimony before the First Committee on behalf of non-governmental organizations (NGOs), calling for more involvement of civil society in disarmament processes and greater awareness of the gendered dimensions of weapons. Dr. Welty’s statement built upon the outcomes of a Forum held at Pace University earlier this month, where Nobel Peace Prize Laureate Jody Williams challenged campaigners working on disarmament and arms control to take gender more seriously. 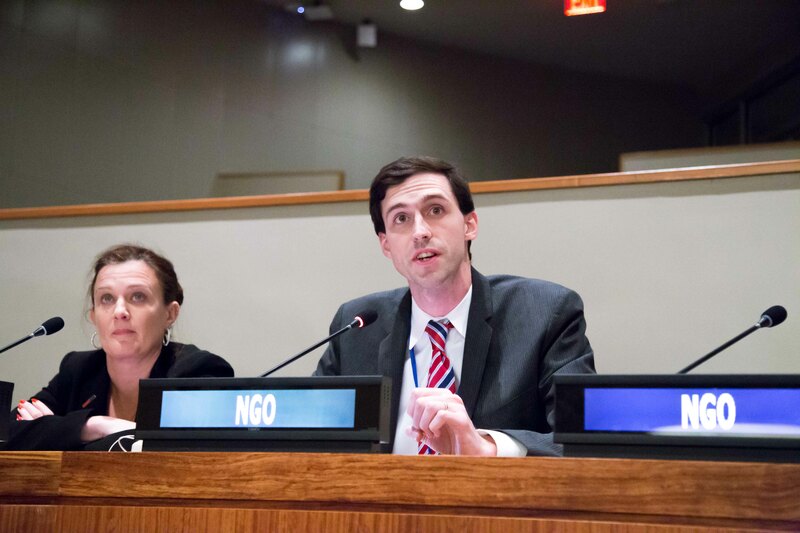 Dr. Matthew Bolton, Assistant Professor of Political Science and Model UN advisor at Pace University New York City, calls on the UN General Assembly First Committee to include greater civil society participation in disarmament processes. Photo: Shant Alexander for Control Arms. In addition to faculty, current and former Pace Model UN students have also made their mark on the First Committee’s proceedings. Vato Gogsadze ‘15 and Munaza Javed ‘14 are serving with the Permanent Missions of Georgia and Pakistan, respectively, and Shant Alexander ‘14 has been supporting the Control Arms coalition’s advocacy regarding the Arms Trade Treaty. Meanwhile, research that Cassandra Stimpson ‘13 did as a student at Pace is credited in a new policy report by WILPF and Article 36 on the gendered impact of drone strikes that has been distributed in First Committee and widely read by diplomats. Located only two express subway stops from the iconic United Nations complex on the East River, Pace University’s scholars actively engage with global policymaking debates. Numerous Pace students interned or worked with Control Arms in advocacy efforts during the Arms Trade Treaty negotiations in July 2012 and March 2013. Last year, Pace hosted an expert symposium on Robotic Weapons Control, and the university has partnered with the UN Commission on the Status of Women to create workshops on global policies that affect women and girls. Pace University has a 60-year history of excellence in regional, national and international Model United Nations conferences and encourages its students to develop the skills and capacities needed to thrive as global citizens. Drawing students from around the world, Pace has numerous academic programs related to international affairs, including political science, peace and justice studies, women’s and gender studies, global Asia studies, international management, Latin American studies, modern languages and cultures, and environmental studies. This entry was posted in News and tagged Arms Trade Treaty, Article 36, Cassandra Stimpson, Control Arms, Dyson College of Arts and Sciences, Emily Welty, First Committee, Matthew Bolton, Model UN, Model United Nations, Munaza Javed, Pace University, Peace and Justice Studies, Political Science, Shant Alexander, United Nations, Vato Gogsadze, Women's and Gender Studies, Women’s International League for Peace and Freedom. Bookmark the permalink.